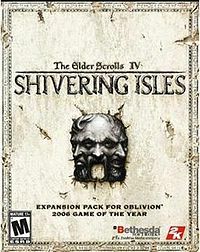 Shivering Isles is the first and only major expansion for Oblivion, and the only major expansion pack for the game. Set within Sheogorath's plane of Oblivion, the Daedric Prince seeks a mortal champion to save the realm from the devastating Greymarch, led by the dreaded Forces of Order. Many mysteries await investigation in this twisted, split reality that the Prince of Madness calls the Shivering Isles. About — Overview of the Shivering Isles expansion pack. Crime — The laws of Sheogorath's Madhouse. FAQs — Frequently Asked Questions about Shivering Isles. Magic — A list of spells, scrolls, powers and blessings that can be discovered in the Isles. Items — Details on all the new items added by the expansion. Traps — The dungeons in the Shivering Isles are full of devious new traps. Creatures — A list of the creatures added by the expansion. Factions — Information on the different factions of Shivering Isles. Maps — A complete overview of the Shivering Isles. NPC Classes — Unique classes for NPCs in the expansion. People — All of the named individuals in the Shivering Isles. Places — Various settlements, caves, ruins and other locations in Shivering Isles. Services — A list of people in the Shivering Isles who provide services. Concept Art — An archive of concept art created during the expansion's development. Screenshots — Promotional screenshots of the expansion from prior to its release. Achievements — All of the achievements that can earned with the Xbox 360 version of Shivering Isles. Development Team — A complete list of staff who contributed to development of the expansion. Easter Eggs — A list of easter eggs and other oddities in Shivering Isles. Glitches — Known glitches and oversights in Shivering Isles. Historical References — References to people, places, and events from previous The Elder Scrolls games. Loading Screens — Information that appears while the game loads. Esta página foi modificada pela última vez à(s) 16h54min de 26 de janeiro de 2016.